The name “Halong” means “Descending Dragon”, which also relates to the Legend about the bay that inspires many Vietnamese generations. It’s been said at the beginning era of this country; the Vietnamese had to face brutal invasion from another country coming from the North through the sea. So they prayed for a miracle. To help the people fight against invaders, Emperor Jade sent a mother dragon down together with her children to stop the enemy’s ships. As the ships advanced into Vietnam’s ocean, the dragons spat fire at them. At the same time, they were spitting out jewels and jade which turned into islands and islets dotting the emerald waters and linking together to form a great wall preventing outsiders’ intrusion. After the invaders were defeated, the dragon fell in love with the peaceful seascape and decided to make their home in the bay. Thus, the place the mother dragon descended onto is now called Halong Bay. 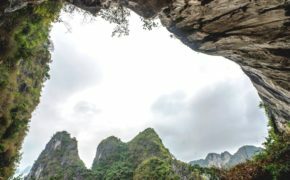 The place where the children dragons descended upon is called Bai Tu Long Bay (a part of Cat Ba Island) and where their tail placed is called Bach Long Vi. 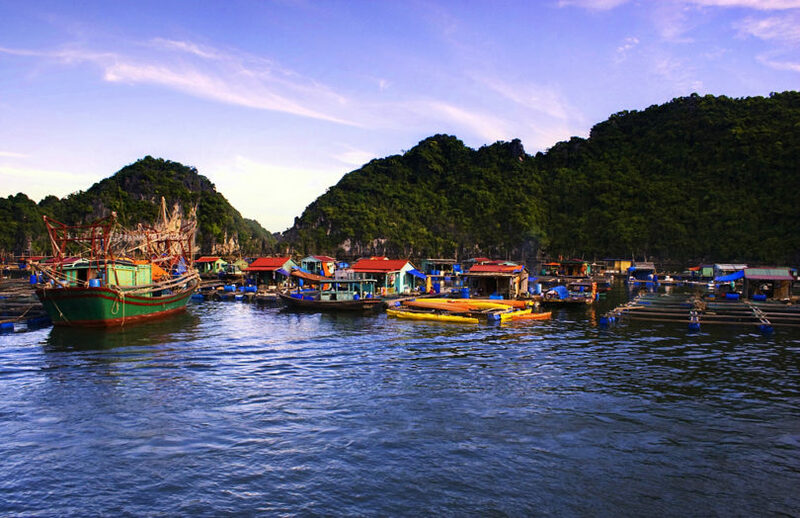 As a result of million years of creation, Halong Bay is densely concentrated of stone islands and caves. Many of them are worldly recognized for their spectacular panoramas and incredible ancient marine limestone accumulation. 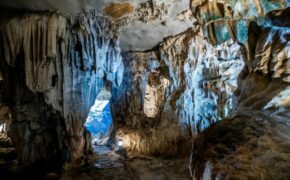 Because of going through the Karst evolution in millions of years, the permanent erosion process of rain and tides from the sea resulted into peculiar geological formation of the most unique valleys, Karst lake-sand towers in the world, and a complex system of primitive caves. Therefore, biodiversity is Halong’s greatest strength to attract international visitors to come and explore. Meanwhile, if examining the area in scientific methods, Halong is claimed of its existence for 500-570 million years ago. Its total area is 1,553 km2 with 120 km of coastline. Within the vast space, the bay consists of 1,969 islands of various sizes, only 989 of which have been given names. Besides the famous Halong Bay, there are Bai Tu Long Bay, which is located in the east of Halong, and Lan Ha Bay that is in the south of Halong and is a part of Cat Ba Island. Halong and Lan Ha Bay contain the majority islands of the whole area, which are made of limestone and schist. Perhaps Halong Bay was widely known for travelers much before Bai Tu Long and Lan Ha Bay, the place has become too commercialized according to some visitors. They say there is nothing “exotic” left in Halong, and have gradually shifted to travel the other two bays to witness more magnificent sceneries. But the truth is Halong Bay is so tremendous that makes you wonder of having experienced its deeper and less crowded parts? 1. 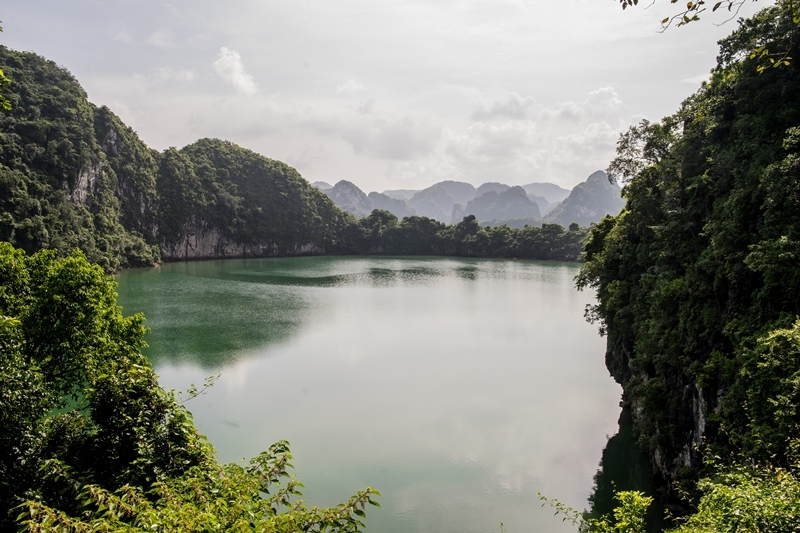 Ho Ba Ham: Located about 25 km from Tuan Chau International Passenger Port, the area comprises three round pits enclosed by limestone mountains. Narrow and dark tunnels connect the pits. Ho Ba Ham is perfect for kayaking. This is also the best way to discover this area. Paddle through limestone cave and enjoy a pristine beach found on the other side. 2. Tung Sau Pearl Farm: It was in 1995 when a Japanese organization founded the first pearl village of Halong Bay. After its success amongst the pearl production industry and tourism, the operations have been passed along to the Vietnamese. 30ha property is equipped with 3,000 cages of seafood for eating and selling. By exploring the farm, guests will be able to witness and experience the painstaking process of growing, harvesting, and extracting pearls from the first step to the last. In addition to the briefing on how to grow and cultivate these precious pearls, the tour also includes a small lecture on what kinds of pearls there are; the Akoya pearls, Tahiti pearls, and the South Sea pearls; their differences, how long it takes to harvest each kind, and why the prices differ from each other, making it a truly educational activity even for those who are not big fans of jewelry. 3. Cua Van Floating Fishing Village: The village stretch from Tung Sau Area to Hang Trai Island, 20km away from Bai Chay Wharf. It is the largest among the remaining four villages with an estimated population of 700 or more that depend mainly on fishing for their livelihoods. Here, guests can dwell in the local traditions and try out the bamboo boat as well as other local experiences. Despite its small size, Cua Van has been recognized as one of the world’s 16 most picturesque villages by Journeyetc.com. In 2015, the US online newspaper Huffington Post had named the village as the world’s most charming little town. 4. Tien Ong Cave: Tien Ong Cave was open for public in 2010 being the latest attractions in Halong Bay. It is much less touristy than other popular caves. You can find a well-reserved system of stalagmites and stalactites that take many different shapes. The cave is near the center of the limestone island with a large entrance to the northwest. Neither it is steep nor craggy; therefore, elderly visitors can easily walk inside the cave. 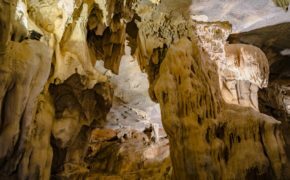 All the excavations proved that the cave was home to ancient Viet people 10,000 – 8,000 years (BC) ago. The cave is cool and airy in the summer yet warm in the winter, and a safe place to hide from the storm and typhoon. Ancient people were aware of this, so they chose this cave to be their house. During the Vietnam War, the cave became a natural bomb shelter keeping thousands alive. Cruising with Bhaya, guests will be able to explore most of the less-known gems of Halong Bay. A typical journey goes through two days and one night on a cruise, which will allow you to visit Tien Ong Cave and dwell in the life of Cua Van Floating Fishing Village. 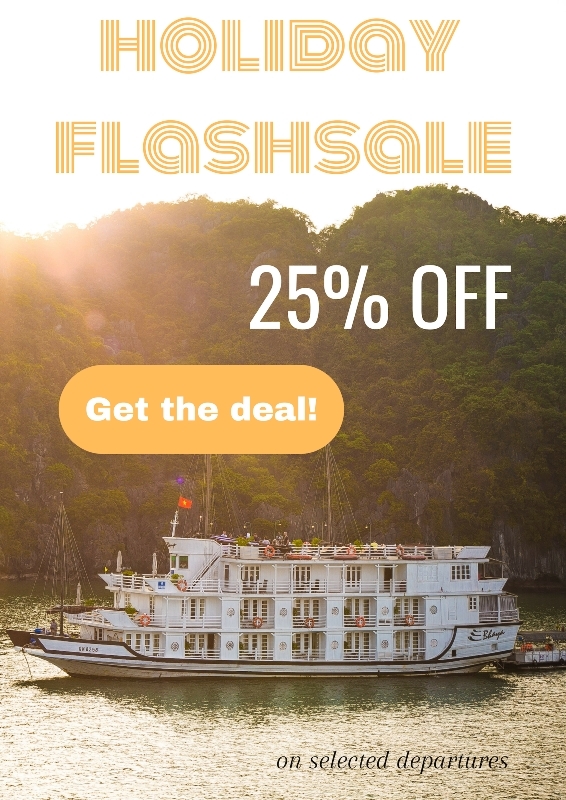 For those who’d love to seek more of Halong’s quiet beauty, joining the three-day-two-night cruise is a more suitable option as you can indulge in the purity of Ho Ba Ham, see the making of world-class pearls in Tung Sau Pearl Farm, be in awe of Tien Ong Cave, and even spend time to reach out the very pristine Viet Hai Village in Lan Ha Bay. Plus a fulfilling culinary exposure along with many activities are inserted to satisfy all our guests’ needs. Within a limited amount of time, it is absolutely possible to experience one of the World’s heritages and watch the most beautiful sunset spot in South East Asia. Halong has been recognized in multiple top-place-to-visit ranking, so truly this vast space of beauty must have a lot to offer. Bhaya Cruise can ensure to create not only a precious but also an affordable trip of your life.